"Fiscal 2018 third quarter results reflect a goodwill impairment charge of $182.2 million, or $8.13 per diluted share after-tax, related primarily to the sustained decline in the Company's market value to a level below book value." 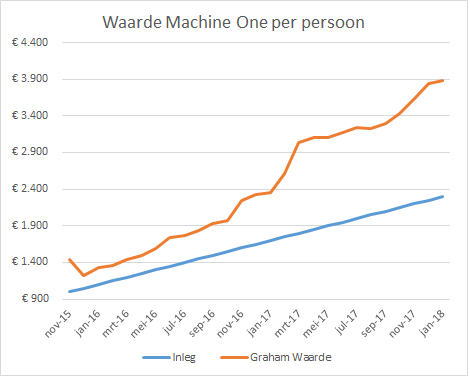 Dat is een boek verlies (ze zijn niet dat bedrag in contant geld kwijtgeraakt), maar het heeft een invloed op de boekwaarde dat $8 per aandeel is gedaald, waardoor de Graham waarde ook daalt. 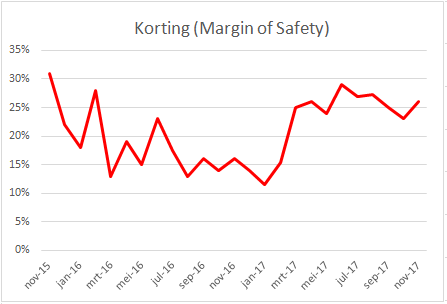 We hebben een plukje Assured Guaranty gekocht met een grote korting. 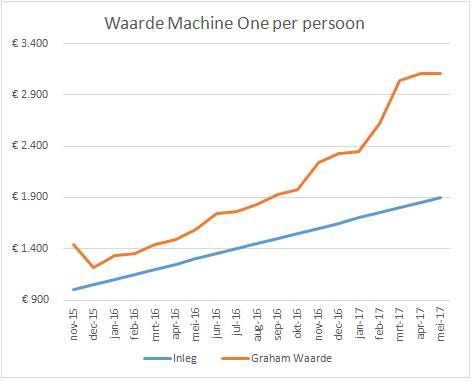 Eind Graham Waarde is: €3 882 per persoon. 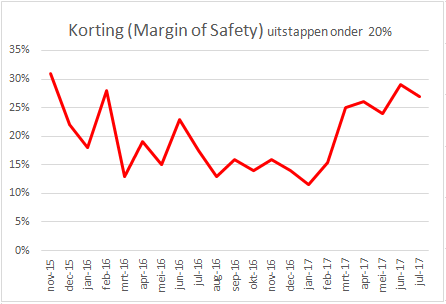 Dit zal hoogst waarschijnlijk niet behaald worden volgend jaar. 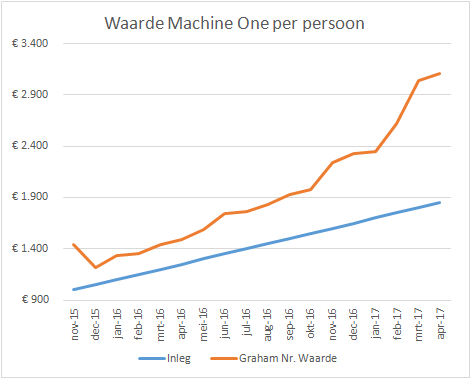 De Graham Waardes van onder andere National Nederlanden en Assured Guaranty (die financieel zijn en dus geen Graham Defensief Stocks) zijn zeer twijfelachtig. 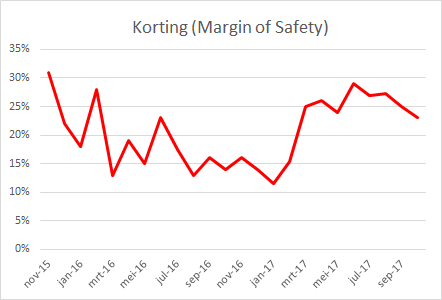 Price = only $35 = 60% margin of safety (korting). The company insures (assures) loans from governments. Puerto Rico has gone bankrupt, so this costs the company money, but less than Mr. Market seems to think. Total exposure is $4,8billion but $2 billion of this is after 2030. The company's income from investments is $400 million a year, higher than the total loss when spread out. The company is using cash on hand to buy back its own shares at a discount, which increases the value of shares which are sold back. The CEO, http://assuredguaranty.com/about-us/our-people/board-of-directors/dominic-frederico is experienced and the company survived the financial crisis of 2008-2009 quite well. Fits the Graham Defensive Analysis, except for the fact that it is a financial company. Proposal: Buy 25 more shares Assured Guaranty at $35 which would be 2% of our portfolio. AGO is in the Financial sector, which is one sector that this methodology avoids. Technology and financial stocks were considered too risky to invest in when this methodology was published. Although times have changed since then with respect to the risk of financial stocks, several of Graham's criteria, like the Current Ratio and Debt to Current Assets, do not apply to financial companies. As a result, the company will not be able to pass this methodology, although we will include the remainder of the analysis for informational purposes. The investor must select companies of "adequate size". This includes companies with annual sales greater than $1 billion. AGO's sales of $1,782.0 million, based on trailing 12 month sales, pass this test. The current ratio must be greater than or equal to 2. Companies that meet this criterion are typically financially secure and defensive. AGO is a financial stock so the current ratio analysis cannot be applied and this criterion cannot be evaluated. Long term debt must not exceed net current assets. Companies that meet this criterion display one of the attributes of a financially secure organization. AGO is a financial stock so this variable is not applicable and this criterion cannot be evaluated. Companies must increase their EPS by at least 30% over a ten-year period and EPS must not have been negative for any year within the last 10 years. We have data for 9 years, and have adjusted this requirement to be a 27% gain over the 9 year period. Companies with this type of growth tend to be financially secure and have proven themselves over time. AGO's EPS growth over that period of 403.8% passes the EPS growth test. The Price/Earnings (P/E) ratio, based on the greater of the current PE or the PE using average earnings over the last 3 fiscal years, must be "moderate", which this methodology states is not greater than 15. Stocks with moderate P/Es are more defensive by nature. AGO's P/E of 5.53 (using the current PE) passes this test. The Price/Book ratio must also be reasonable. That is, the Price/Book multiplied by P/E cannot be greater than 22. AGO's Price/Book ratio is 0.60, while the P/E is 5.53. AGO passes the Price/Book test. SECTOR: [PASS] Krka Group is a pharmaceutical company and neither a technology nor financial Company, and therefore this methodology is applicable. SALES: [PASS] The investor must select companies of "adequate size". This includes companies with annual sales greater than €260 million. Krka Group's sales of €1 200 million, based on 2017 sales, pass this test. CURRENT RATIO: [PASS] The current ratio must be greater than or equal to 2. Companies that meet this criterion are typically financially secure and defensive. Krka Group's current ratio: €848m current assets / €317m current liabilities of 2.7 passes the test. LONG-TERM DEBT IN RELATION TO NET CURRENT ASSETS: [PASS] For industrial companies, long-term debt must not exceed net current assets (current assets minus current liabilities). Companies that do not meet this criterion lack the financial stability that this methodology likes to see. The long-term debt for Krka Group is €116 million, while the net current assets are €131 million. Krka Group passes this test. LONG-TERM EPS GROWTH: [FAIL] Companies must increase their EPS by at least 30% over a ten-year period and EPS must not have been negative for any year within the last 5 years. Companies with this type of growth tend to be financially secure and have proven themselves over time. 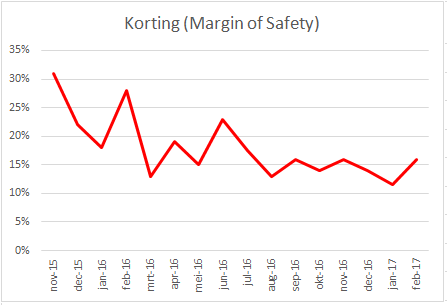 Krka Group has consistently made money, but earnings have only increased 15% since 2007. Krka Group fails this test. 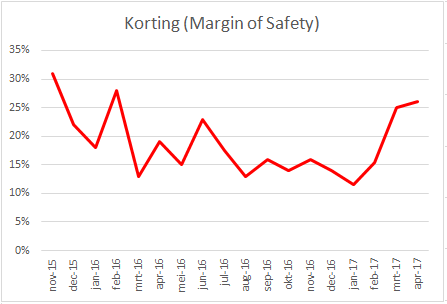 Earnings Yield: [PASS] The Earnings/Price (inverse P/E) %, based on the lesser of the current Earnings Yield or the Yield using average earnings over the last 3 fiscal years, must be "acceptable", which this methodology states is greater than 6,5%. Stocks with higher earnings yields are more defensive by nature. 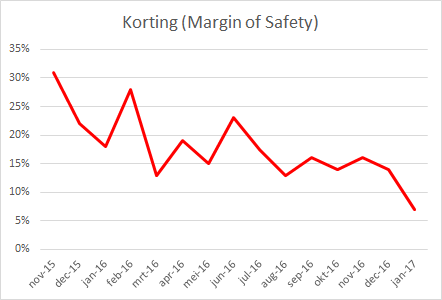 Krka Group's E/P (using the current 2017 profits) are €4,5 / €9 = 8,5% and passes this test. Graham Number value: [PASS] The Price/Book ratio must also be reasonable. That is the Graham number value must be greater than the market price. 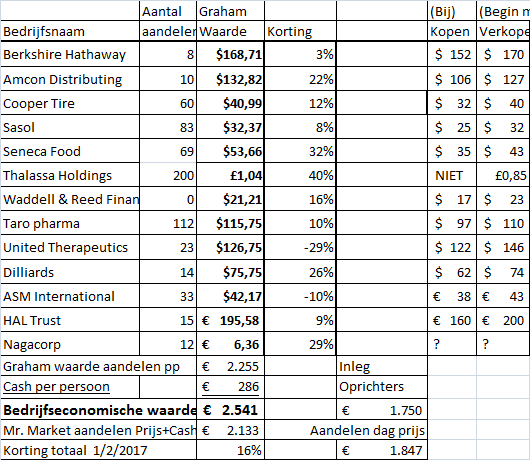 Krka Group has a Graham number of √(15 x €4,5 EPS x 1,5 x €44 Book Value) = €66,7 Price (wat de gek ervoor geeft) is € 53 December 7th 2017.
Dividend: 2,75/53 Euros is 5,1% note that the dividend has been increasing during the past years. Conclusion: Krka Group is a defensive stock. 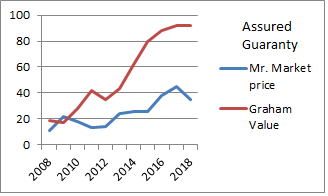 The increase in earnings over the past 10 years is slightly lower than Graham stipulated. The stock probably won't make you rich over-night but should help increase your wealth over time. 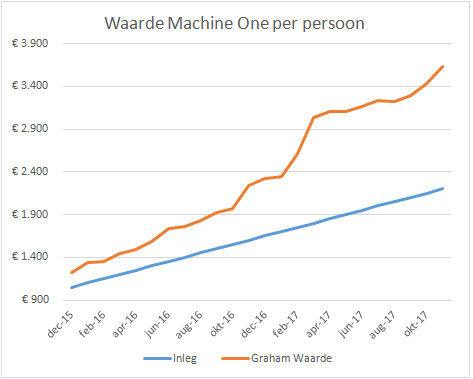 We hebben Genesco bijgekocht een retailer met hoge korting ten opzichte van Graham waarde. 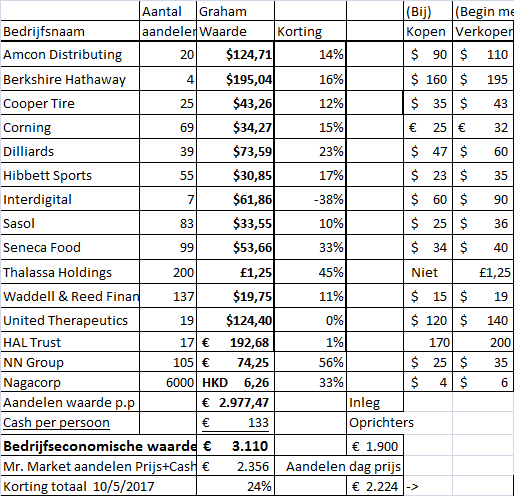 De laatste aandelen Corning Glassworks zijn verkocht toen de koers tot $32,50 ongeveer de Graham waarde steeg. 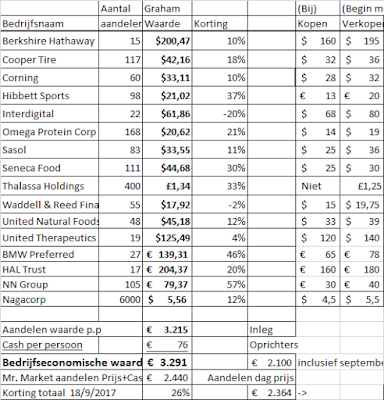 Ook United Natural Foods (leverancier aan Amazon Whole Foods) hebben we met winst verkocht toen de koers steeg naar $46,04. We hebben ook ASM International bijgekocht vandaag. 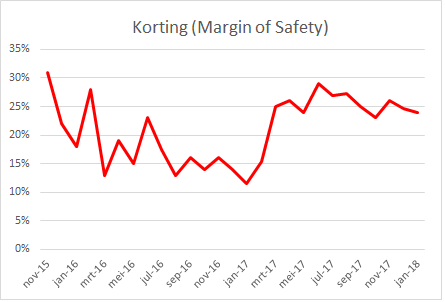 De verkooppunt hiervan is iets hoger in verband met analyse van machinist Marc Mochel die veel verwacht van het bedrijf. 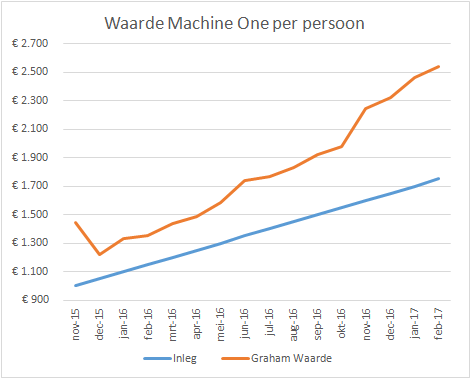 De stijging van de Graham waarde zal niet zo snel gaan in de toekomst als de afgelopen maanden. Er zijn sprongen dit jaar geweest o.a. door de aanschaf van NN Verzekeringen en BMW aandelen. 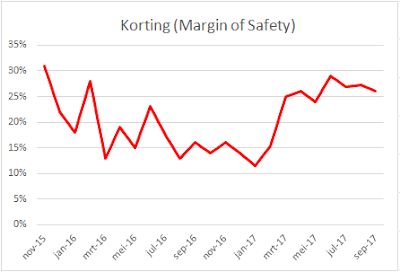 Onze verwachting is ongeveer 9% gemiddeld per jaar. (Behaald door de Validea Stock Screen sinds 2003). ASM International deels verkocht en meer Genesco en Natural Alternatives met meer Waarde in vergelijking met Prijs (koers) gekocht. Dollar 2% gestegen t.o.v. Euro. 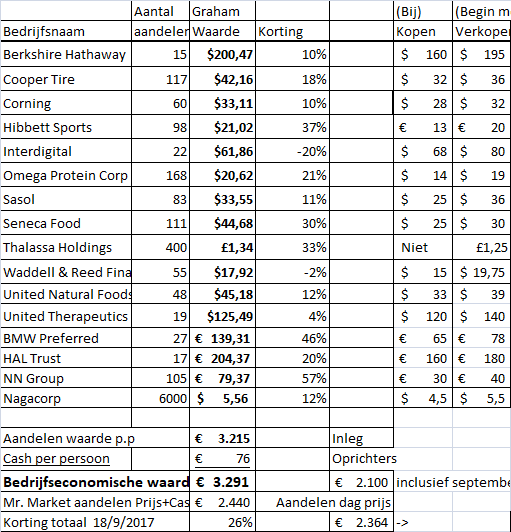 Omega Protein is overgenomen voor 35% meer dan de koers, dat wil zeggen $22 per aandeel, iets meer dan de Graham Waarde van $20,56. Ondanks een maandelijks inleg van 50 Euro is de totale Graham waarde afgenomen sinds begin juli. Dit komt met name door de afgenomen omzet en winst bij retailer Hibbett Sports. 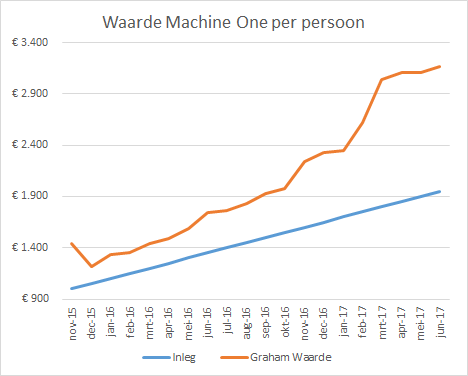 We berekenen nu de Graham waarde met $1,30 Earnings per Share (winst per aandeel) in plaats van $2,50. We hebben ook Interdigital. We zijn nu 100% in aandelen belegd doordat de Mr. Market price (wat de gek ervoor geeft), de afgelopen maanden met minder dan 1% per maand is gestegen. 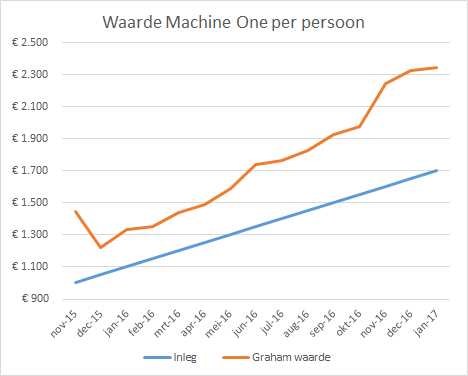 De planning cash versus aandelen moeten we updaten voor de komende perioden. Outokumpu is a global leader in stainless steel and is executing a large-scale transformation in its operations with a target to return to the sustainable profitability. Following the merger with the German steel conglomerate Inoxum in 2013, Outokumpu has consolidated its production capacity in Europe, established a strong foothold in the Americas, and decisively implemented cost efficiency measures and saving programs in order to lower the overall cost level of the company. As a result, today Outokumpu is a global leader in stainless steel with a unique global production set-up. Outokumpu strategy focuses on areas, where the company aims to further increase its operational efficiency to make the most of the Group’s assets and leverage its strengths to differentiate from competitors. In order to leverage its strong presence in the most attractive key markets, Outokumpu builds on its strong legacy in quality, innovation, and technical expertise, and systematically improves delivery performance and customer relationships in order to provide the best customer experience in the industry. 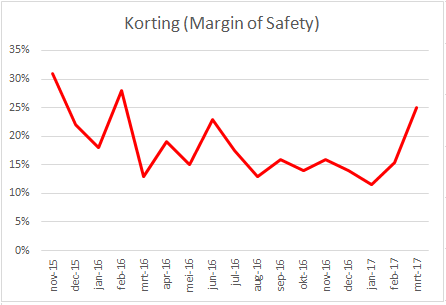 Dutchman Roeland Baan became the CEO on January 1st, 2016 and is working to improve safety, decrease debt and cut costs (including the number of employees). His efforts seem to be paying off. SECTOR: [PASS] Outokumpu is neither a technology nor financial Company, and therefore this methodology is applicable. SALES: [PASS] The investor must select companies of "adequate size". This includes companies with annual sales greater than €260 million. Outokumpu's sales of €5 700 million, based on 2016 sales, pass this test. CURRENT RATIO: [FAIL] The current ratio must be greater than or equal to 2. Companies that meet this criterion are typically financially secure and defensive. Outokumpu's current ratio €2 483m/€1 942m of 1.3 fails the test. LONG-TERM DEBT IN RELATION TO NET CURRENT ASSETS: [FAIL] For industrial companies, long-term debt must not exceed net current assets (current assets minus current liabilities). Companies that do not meet this criterion lack the financial stability that this methodology likes to see. The long-term debt for Outokumpu is €1 502 million, while the net current assets are €541 million. Outokumpu fails this test. LONG-TERM EPS GROWTH: [FAIL] Companies must increase their EPS by at least 30% over a ten-year period and EPS must not have been negative for any year within the last 5 years. Companies with this type of growth tend to be financially secure and have proven themselves over time. Outokumpu made a loss from 2008 through 2014. Outokumpu fails this test. 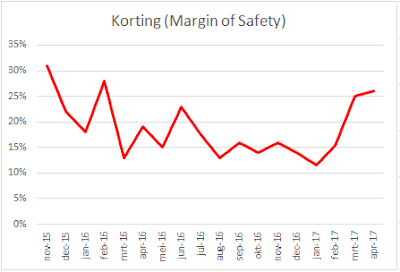 Earnings Yield: [PASS] The Earnings/Price (inverse P/E) %, based on the lesser of the current Earnings Yield or the Yield using average earnings over the last 3 fiscal years, must be "acceptable", which this methodology states is greater than 6,5%. Stocks with higher earnings yields are more defensive by nature. Outokumpu's E/P (using the current 2017 profits) are €1,2/€9 = 13,3% and passes this test. Graham Number value: [PASS] The Price/Book ratio must also be reasonable. That is the Graham number value must be greater than the market price. Outokumpu has a Graham number of √(15 x €1,2 EPS x €6,21 Book Value) = €12,95 Price (wat de gek ervoor geeft is € 9 (5 october 2017). De waarde is maar €10 Euro toegenomen ondanks een inleg van €50. 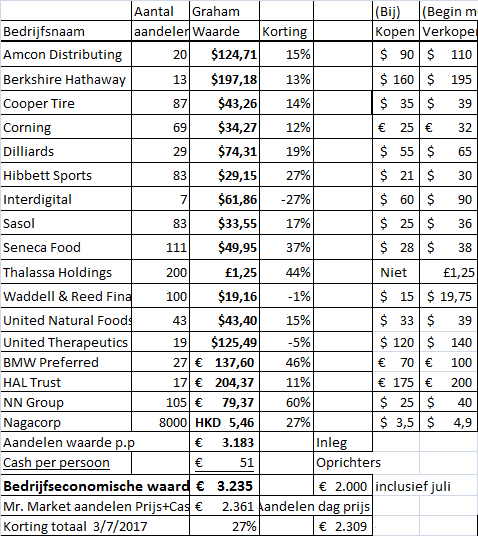 Dit komt door dalende winsten bij Hibbett Sports, Amcon Distributing en Cooper Tire. 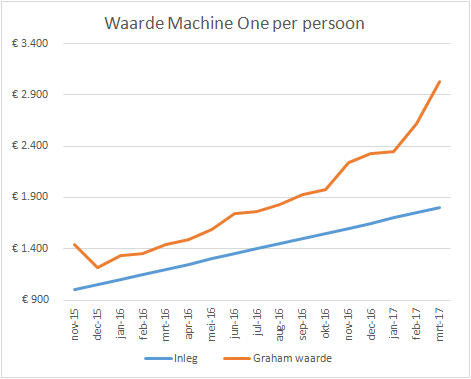 Als de winst daalt, dan daalt ook de Graham Waarde (de geometrisch gemiddelde van 1,5 x booekwaarde en 15 x de winst). 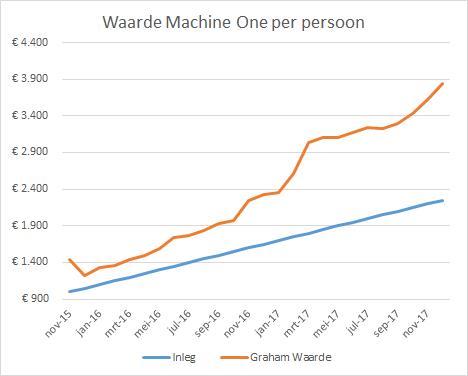 We hebben ook gekozen om ongeveer €500 InterDigital te kopen. 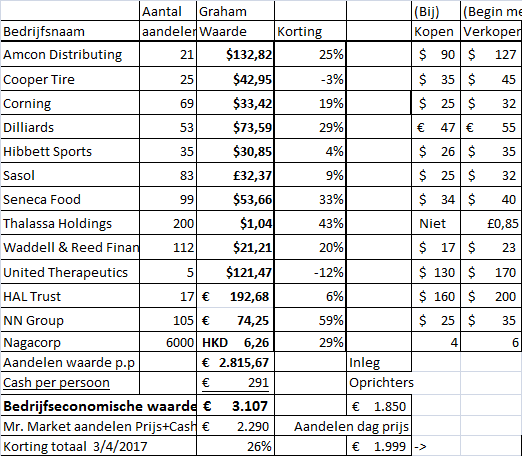 Het heeft een Graham Nummer Waarde van slechts $62 en een koers (Prijs) van $85. 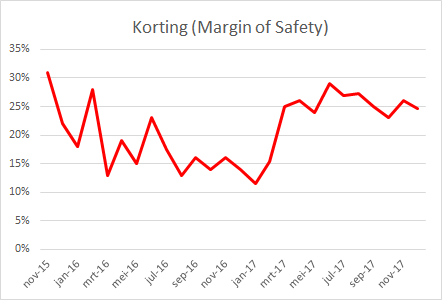 InterDigital heeft een relatief hoge winst per aandeel: $8,8 in vergelijking met de boekwaarde (equity) begin 2016: $14,42. 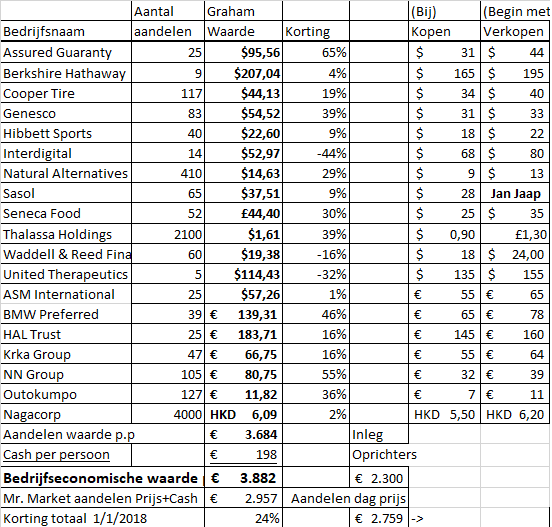 De winst in verhouding met de boekwaarde, oftwel Return on Equity (ROE%) was dus meer dan 50% in 2016: $8,8/$14,42. 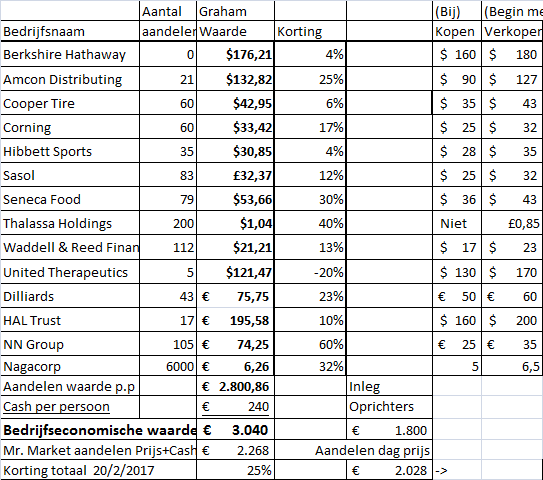 Nu, begin 2017, is de boekwaarde van dit bedrijf gestegen naar $21,58 ( = $14,42 boekwaarde begin 2016 + winst $8,8 - dividend etc). 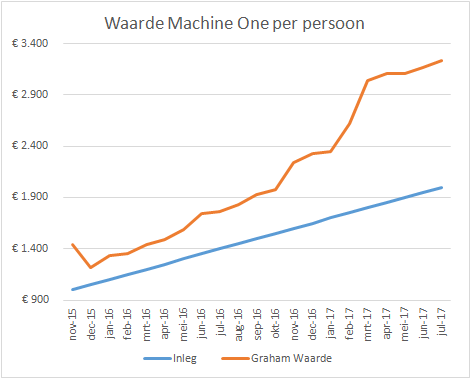 De vraag is of InterDigital de komende jaren ook zo winstgevend kan blijven. 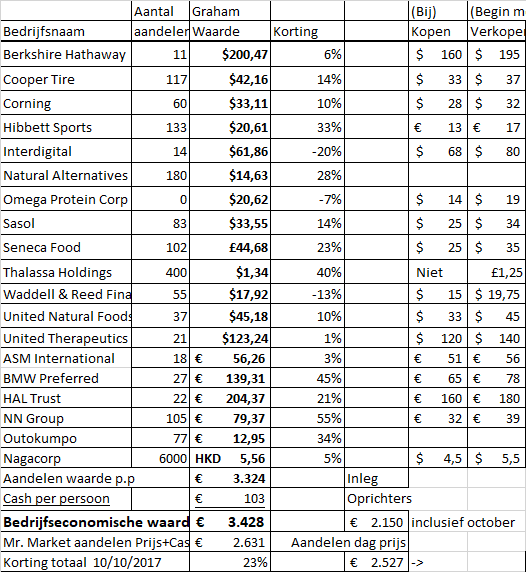 We hebben de helft van Cooper Tire & Rubber verkocht en een beetje Seneca Foods bijgekocht, waardoor we nu meer cash hebben dan begin maart. 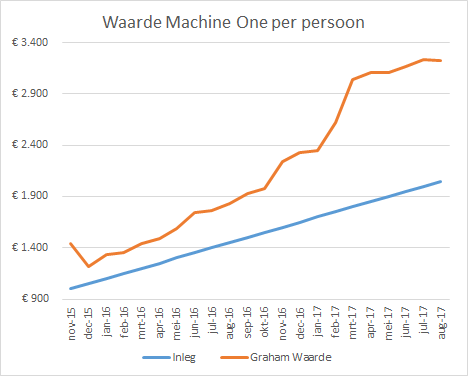 We hebben de laatste aandelen Berkshire Hathaway (Warren Buffett) aandelen verkocht voor de Graham Waarde, nl. $170. 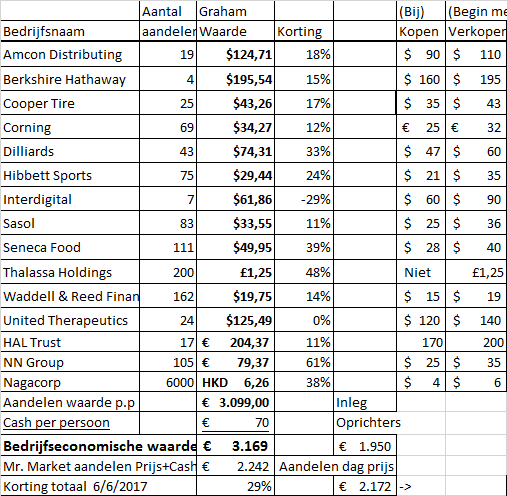 De dollar is gestegen en we hebben vrij veel NN Group aandelen gekocht met 60% korting. 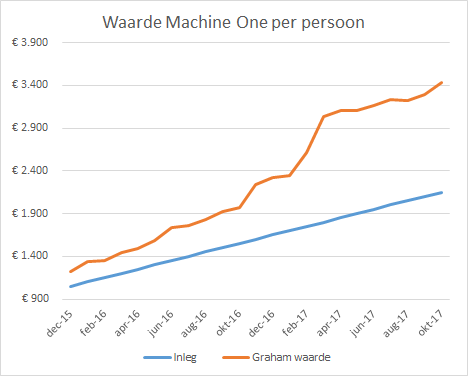 NN heeft een hoge Graham nummer €74 waarde in vergelijking met de prijs €29 zie berekening hier). 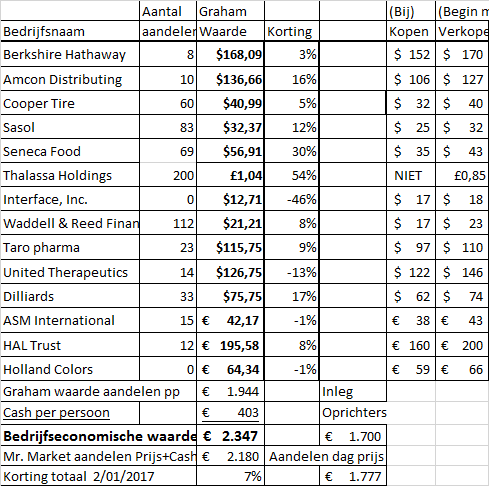 Normaal koopt een Benjamin Graham defensieve belegger geen verzekeraars of banken. 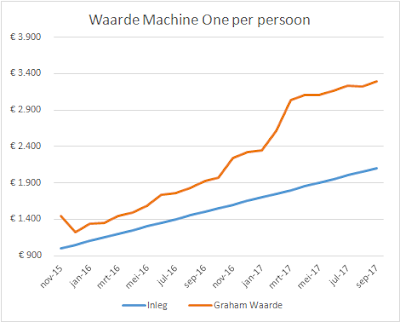 ASM International is verkocht voor €46, iets boven de Graham waarde. Inkoopprijs was €34,50 midden 2016. 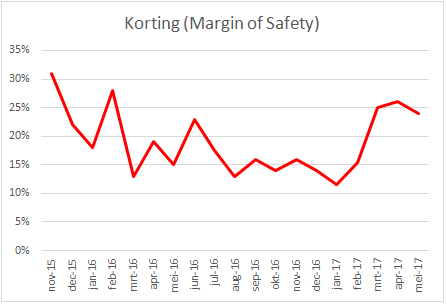 "Value averaging" doel per persoon is €1 977 wat de gek ervoor geeft aandelen prijs in februari. 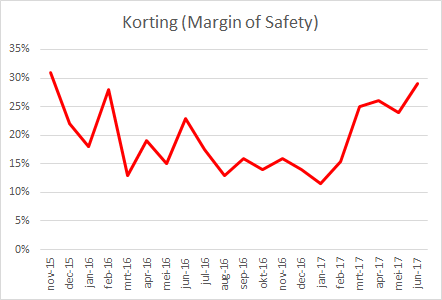 Aandelen dag prijs is nu €1 847, dat is een verschil van €130 (dwz x 12 personen = €1 560 bij kopen na vergadering op 23 februari, mits koersen hetzelfde blijven). 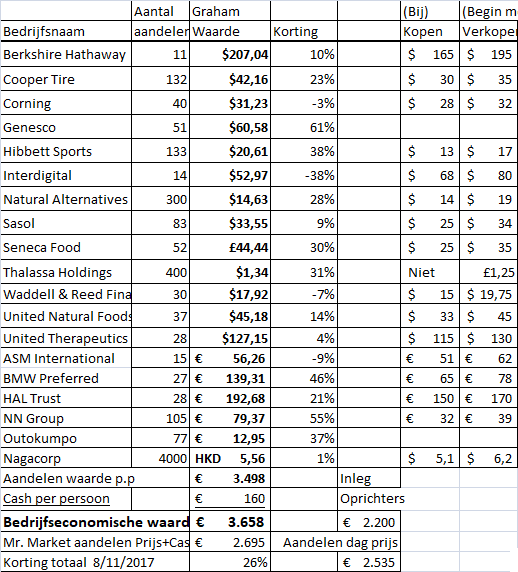 Waarde is is meer dan €50 inleg gestegen door aanschaf extra Dillards aandelen en instap in Nagacorp. 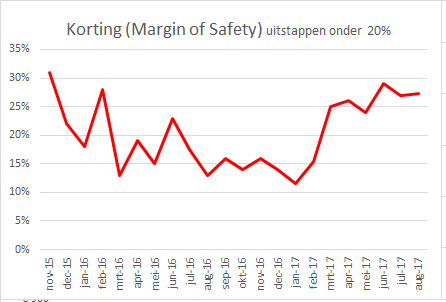 Hopelijk daalt wat de gek vraagt voor onze aandelen de komende maand zodat eventueel nieuwe leden, voordelig in kunnen stappen met een hoge korting, zoals afgelopen juni (23%) na de Brexit referendum.